Let’s create together high-value-added robot-user interaction solutions tailored to your brand image and in line with your strategy. 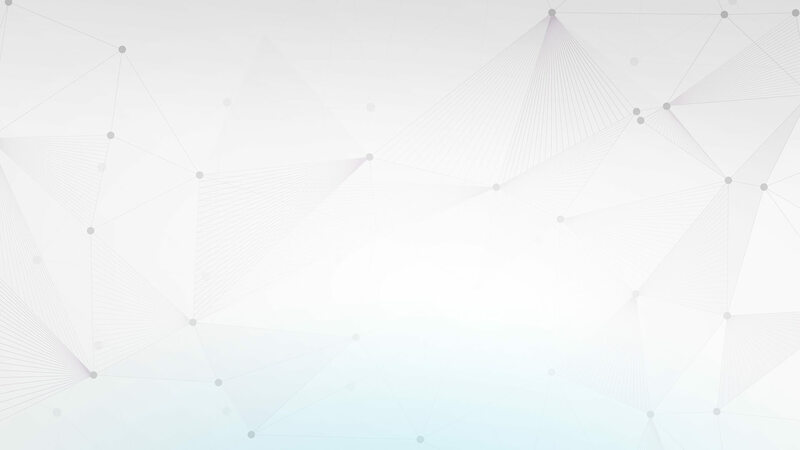 Build innovative and differentiating solutions, services and applications for enhanced customer / user experience creation. Kindergarten & school & restauration for learning, play and creativity. With BUDDY, learning becomes fun & play becomes knowledge. BUDDY is an excellent in-home elderly companion care. He recreates the social bond and prevents from loneliness and isolation. 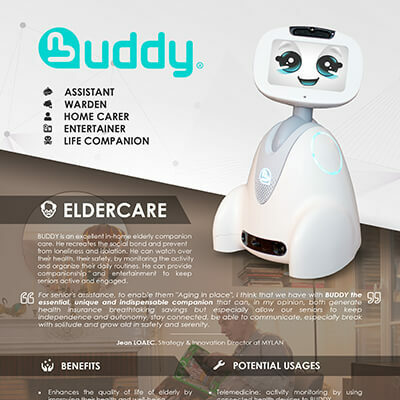 BUDDY, the emotional robot, brings valuable value-added services for the elderly and patients in long-term care or with chronic diseases. 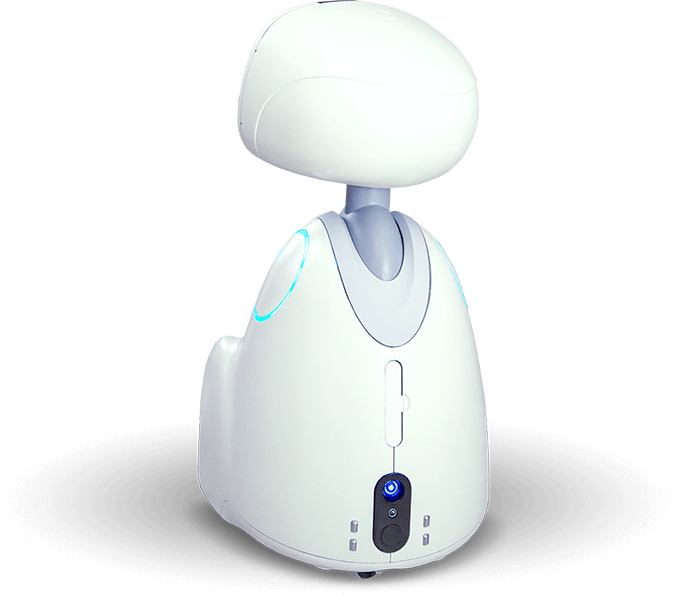 BUDDY acts as an autonomous hub to interact with both its human and material environment. 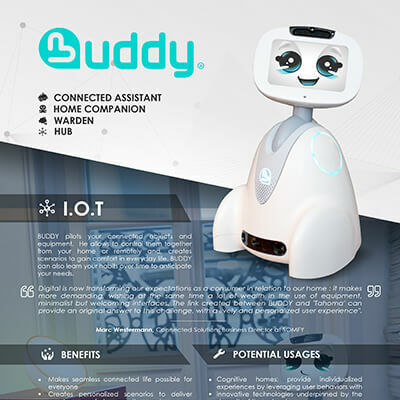 BUDDY pilots your connected objects and equipment. He allows to control them together from your home or remotely.  BUDDY is designed to interact with your visitors and guests in any public place: office, administration, retail, hospitality and entertainment industry. THEY TRUST US: WHY NOT YOU ?  "Digital is now transforming our expectations as a consumer in relation to our home :it makes more demanding, wishing at the same time a lot of wealth in the use of equipment, minimalist but welcoming interfaces. 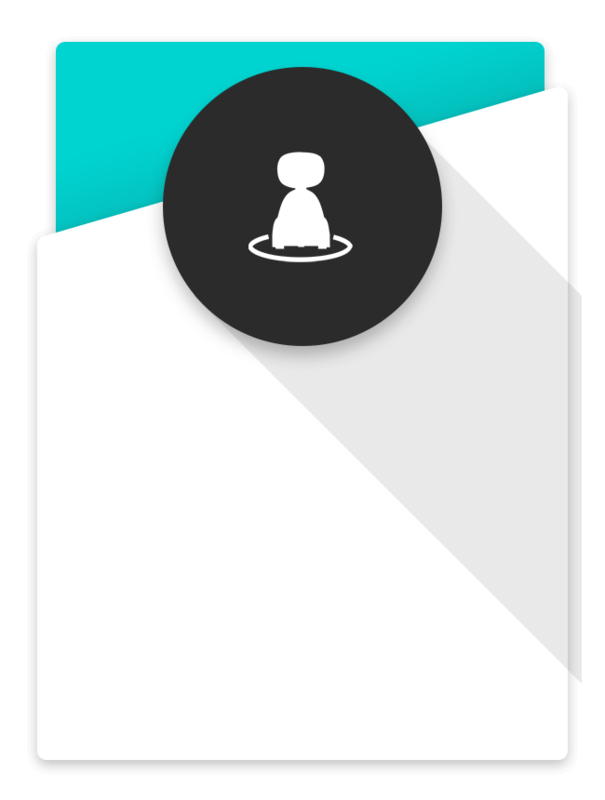 The link created between BUDDY and 'Tahoma' can provide an original answer to this challenge, with a lively and personalized user experience"
HOW CAN BUDDY HELP YOU ? Simply give Robots abilities to the next level of human-machine interaction.  Get the turnkey software tools making AI-driven robot emotional, proactive, evolutive.  Overperform customers need’s and consumer' acceptance. Allowing robots to have better meaningful interactions with people, you will create a more personalized user experience and increase business value. 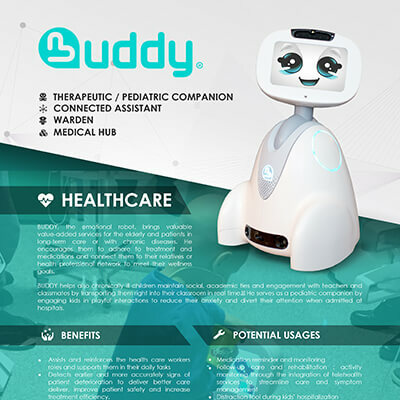 Bring powerful Emotional Artificial Intelligence augmentation to your robots and let BUDDY EAIF leveraging their capabilities to execute these complex functions, including emotional behaviors, empathy for humans and personality. 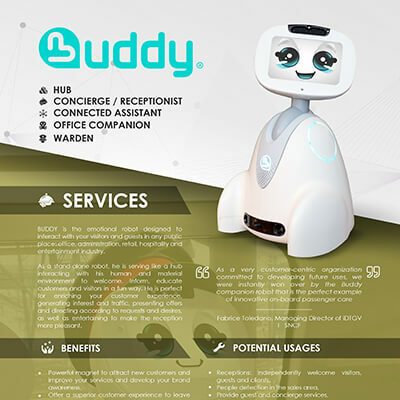 BUDDY EAIF is an integrated end-to-end robotics framework & platform for robotics manufacturers or integrators. Allowing them to deliver highly relevant and customized services across industries such as Education, Healthcare/Silver, Hospitality, Real estate and more. 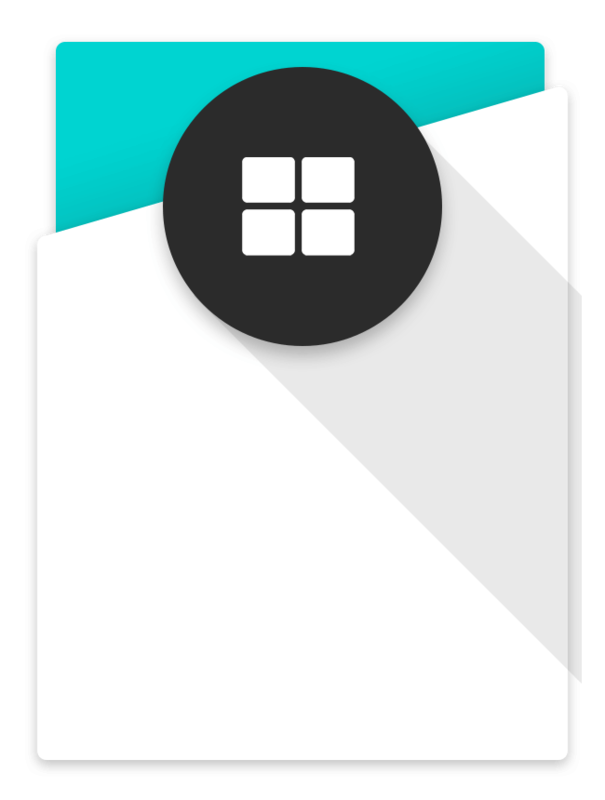 BUDDY EAIF is built to be “Privacy by design” (PbD) in mind, meaning that the integration of embedded recognition bricks on your robots can allows offline use cases. 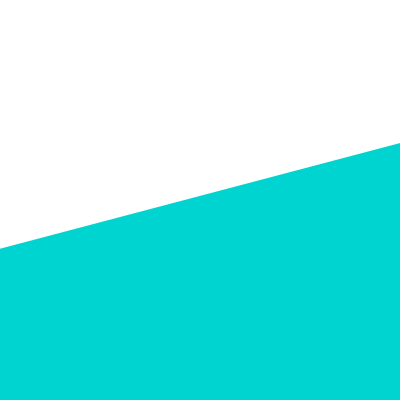 This approach can and will ensure privacy and compliancy with the GDPR (General Data Protection Regulation) as well as resilience to internet outages. 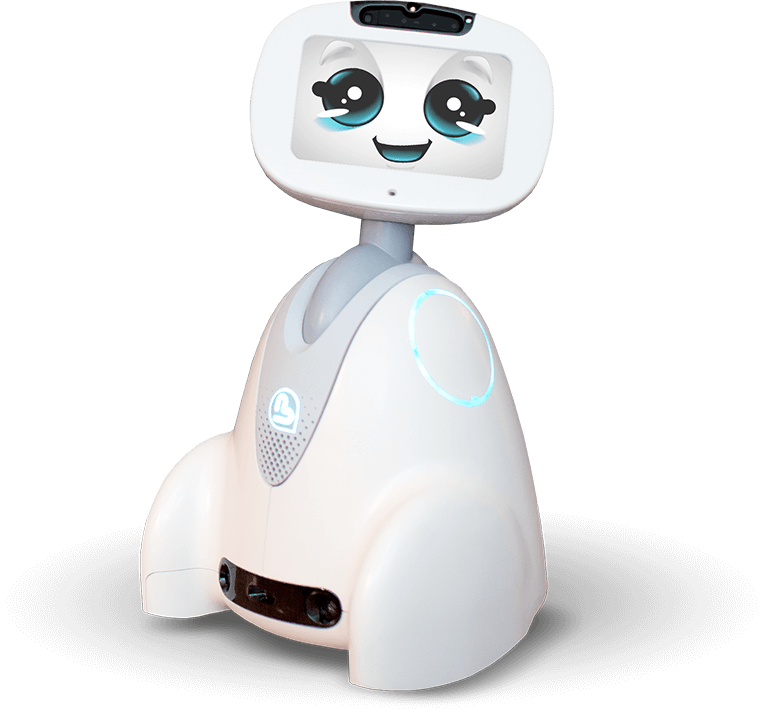 From an easy-to-use SDK and API to emotion-sensing, movements and interactions, BUDDY EAIF is humanizing technology by adding alive-like qualities to robotic systems. 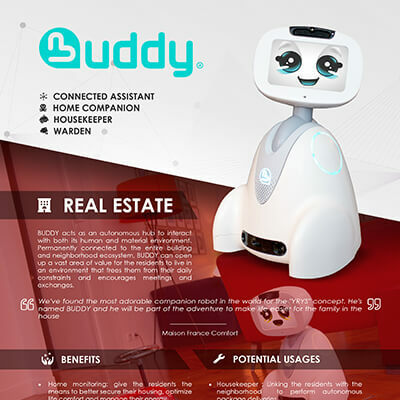 Using BUDDY EAIF solution, developer can significantly enhance the user experience and creating more natural user interactions by adapting the robot hardware to different emotional contexts and people. Please contact us through the form below, and we will get back to you. 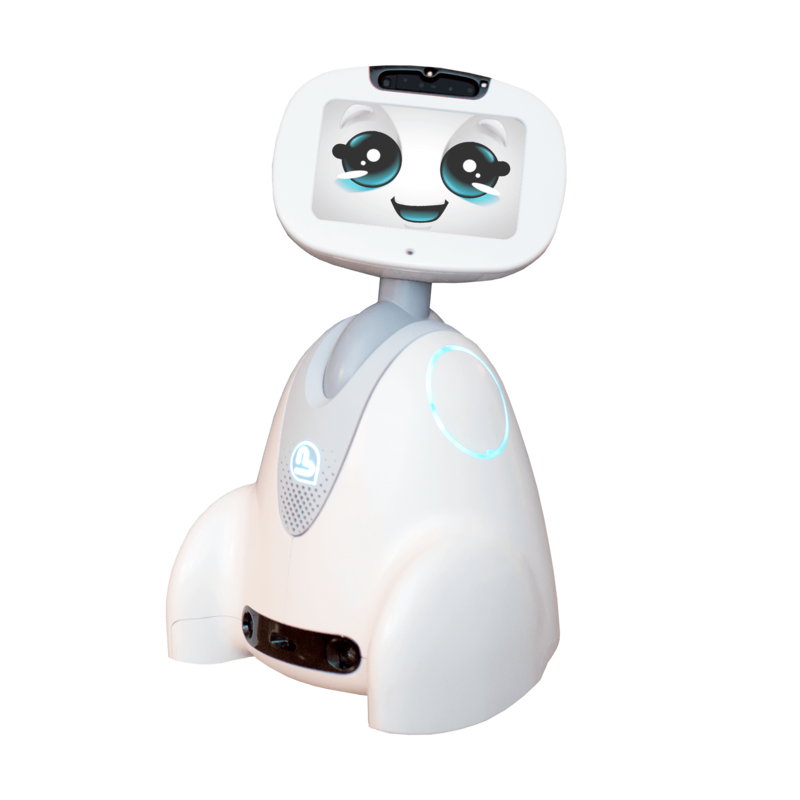 Thank you for your interest in BUDDY, the emotional robot and BUDDY EAIF (Emotional AI Framework).  We’re eager to understand your needs and discuss you project.